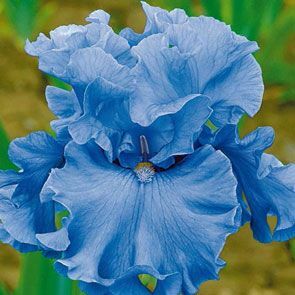 Add some true-blue beauty to your garden with Merchant Marine Tall Bearded Irises. These low-maintenance perennial irises grow 36 to 38 inches tall and boast flawless, marine blue blooms. You'll be awed by their lavishly ruffled standards, which twirl upwards over fluffy beards and luxuriously wavy falls. These stunning Dutch flowers bloom in mid to late spring and are deer resistant. Merchant Marine irises are hardy in zones 4 through 9. Each plant enjoys a long lifespan and will return to your garden year after year. To help ensure your irises' continued success, plant them in the fall, about 1 inch deep and 20 to 24 inches apart in well-drained clay, loamy or sandy soil. They thrive in the sunshine, so make sure to place them in a sunny or partially shady area where they will receive full sunlight for around 6 hours per day. When mature, Iris germanica 'Merchant Marine' produces five or more stunning flowers per stem. Make each bloom stand out by planting your irises in their own bed, or spread them throughout your garden in small groups of two to four. These blue bearded irises also look wonderful when placed in their own vase or included in a pastel bouquet. 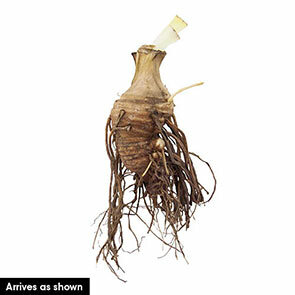 Refresh your garden this spring with Merchant Marine Tall Bearded Irises. Large, copiously ruffled blooms are completely saturated in rich marine blue. Lavish form and colour evoke its famous parent, Yaquina Blue. Exceptional bloomer. Flower Color Marine blue standards and falls.